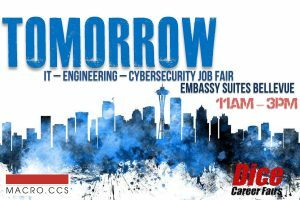 If you can swing a long lunch, or are between jobs and have an open schedule, we’d love to see you at the Dice Career fair in Bellevue tomorrow! Come meet various members of the MACRO.CCS team and grab a drink + some swag at our booth. We’ll be there from 11am-3pm and would love to meet you and discuss our open positions and the next steps in your career.